In a previous article, we examined the origins of Black Lives Matter and how the movement ties into Liberation Theology and Black Liberation Theology. In the earlier article, it was noted that the three women who take credit for starting Black Lives Matter openly state that this movement is about ‘reviving Black Liberation Theology’. We also examined how Black Lives Matter has inserted their own platform of elevating illegal aliens, black women and in particular gay and transgender blacks. The founders of a hashtag that set a country on fire are Alicia Garza, Opal Tometi, and Patrisse Cullors. But who are these women and what do they stand for? 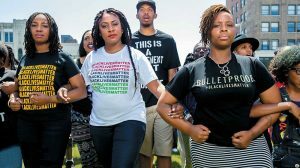 Three Co-Founders of Black Lives Matter movement, Opal Tometi (Left) Alicia Garza (Center) and Patrisse Cullors (Right). Photo courtesy of Patrisse Cullors website under fair use. These three women who founded Black Lives Matter are not your average Americans. All of them are radicals of varying degrees, all three share a Marxist ideology and all three appear to be taking their hashtag and their activism to the bank. Alicia Garza was born in 1981 and currently resides in Oakland, California and has described herself as a ‘queer Social Justice activist’ and an editorial writer. One of her heroes is Assata Shakur. Garza lauds Shakur’s contributions to the ‘Black Liberation Movement’. For those unfamiliar with that name, Shakur is a Marxist revolutionary, a member of the Black Liberation Army, and a former Black Panther. In 1972, Shakur and an associate shot and killed a New Jersey State Trooper and injured another. In 1977, Shakur was convicted of seven felonies, including the murder of the State Trooper. In 1979, Shakur escaped prison and fled to Cuba in 1984, where she sought political asylum. New Jersey Governor Chris Christie called for her extradition earlier in 2016. Speaking of profits, Garza directs the Special Project at the National Domestic Workers Alliance, which is a coalition of, “nannies, housekeepers and care workers”. This organization is a 501(c)3 which has received over $50,000 from George Soros’ Tides Foundation, who has also been a major funding source for Black Lives Matter. The group received $10,000 in 2013 and $40,804 in 2014. Garza is also noted to be the on the Board for People Organized to Win Employment Rights (POWER), a Board member of the School of Unity and Liberation (SOUL) and she was the Board Chair in 2011 for the Right to the City Alliance (RTCA). All of these organizations are well-funded and appear have over-lapping partnerships, funding sources, and alliances. Born in 1984 and raised in Phoenix, Arizona, Opal Tometi is the daughter of two Nigerian immigrants who are alleged to have entered the United States illegally. She attended the University of Arizona, where she graduated with a BA in history and an MA in communications & advocacy. Tometi now resides in Brooklyn, New York. While her two other co-founding partners are gay, Tometi is straight. BAJI is a documented front group for the socialist and Marxist-Leninist group, the Freedom Road Socialist Organization (FRSO). Supplementing her role at BAJI, Tometi is also involved with a network called Black Organizing for Leadership and Dignity (BOLD). This organization primarily teaches black activists how to build a “social justice infrastructure.” and “organize black communities more effectively”. BOLD appears to be aligned with The Praxis Project, which is a, “a nonprofit movement support intermediary that helps to build power in communities to improve health justice across the United States.” According to 2013 IRS filings, The Praxis Project pulled in $2,175,451 in total revenue with only just over $67,000 of that being from grants. Tometi has a local connection to North Carolina. She serves at BOLD with Durham Black Lives Matter organizers and former Durham School Board member, Sendolo Diaminah. Diaminah resigned from the Durham School Board earlier this year after missing more than two-thirds of the meetings due to his ‘activist roles’ and ‘travel’. Tometi is also a board member of the Puente Human Rights Movement, a group whose main purpose appears to be opposing any efforts that might stagnate the flow of illegal immigrants into the country. Cullors was born in Los Angeles, California in 1984 describes herself on her website as an “artist, organizer, and freedom fighter” and also a “self-described wife of Harriet Tubman.” She holds a degree in Philosophy and Religion from UCLA and was a Fulbright Scholar. Cullors also says she is a performance artist. Cullors is also extremely pro-Palestine, signing the “2015 Black Solidarity Statement with Palestine“, which portrayed Palestine as a victim while demonizing any actions taken by Israel and likened the detention of Palestinians to the incarceration of blacks in the United States. Cullors also traveled to Palestine under the Black Lives Matter banner to meeting in ‘solidarity’ with those that Cullors says are ‘under occupation’ by Israel. 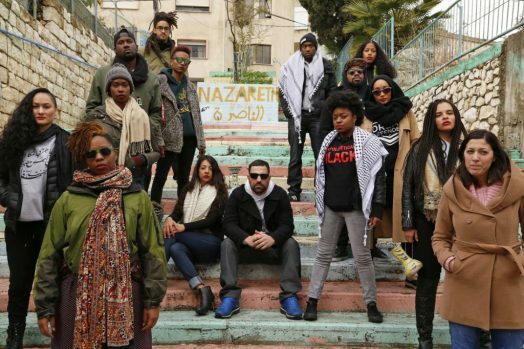 Patrisse Cullors and BLM members in Nazareth. Courtesy of Patrisse Cullors website under fair use. Cullors is gay and in an MSNBC documentary recounted a story of leaving her home at the age of sixteen when she came out to her family. Cullors repeats this information on her website as well as a long list of awards, grants, and accomplishments such as being named a “Civil Rights Leader for the 21st Century” by the Los Angeles Times. Cullors activism and organizing began in her late teens when she joined the ‘Bus Riders Union‘, a transportation advocacy group that claims to ride the bus is “a human right.” The Bus Riders Union still exists and is run by the Labor /Community Strategies Center. Cullors has the distinction of being trained as an activist by Eric Mann of the domestic terrorist group, Weather Underground Organization which bombed a building in Greenwich, NY, the U.S. Capitol building, The U.S. State Department building and the Pentagon during the late 1960’s and early 1970’s. Mann also runs the Labor/ Community Strategies Center. Sometime in or around 2012, Cullors formed a group called Dignity and Power Now (DPN). Their website states DPN is a “grassroots organization based in Los Angeles that fights for the dignity and power of incarcerated people, their families, and communities.” Cullors has made statements over time that show her main driver is the ‘decriminalization of black lives’. DPN, like BAJI, is also associated with the socialist and Marxist-Leninist group, the Freedom Road Socialist Organization (FRSO). DPN’s website says they are a “Community Partners Project”, which is a 501(c)3 with over $35 million in assets. Community Partners basically acts as a business manager for non-profit organizations and handles donations and grants. It’s an easy and legal way for outfits like DPN to obscure their donation levels from the public. This has been a basic overview of these women, with key points about who they are and what drives them. All three of these women work for groups that are fronts for The Freedom Road Socialist Organization, one of the largest radical Left organizations in the country. In fact, it is this organization that likely guides Black Lives Matter as evidenced by inserting itself into the situation in Ferguson. Now that we’ve explored Black Lives Matter on a national level, it’s time to zoom in on the local level. The Freedom Road Socialist Organization needs more exploring, however, as well as some of its local Tar Heel state connections. Check back with American Lens as we take a closer look at Black Lives Matter in North Carolina. This article first appeared at American Lens News on January 4, 2017. This entry was posted in Am Lens, Racial Justice, Resistance, Social Justice, THE LEFT and tagged Alicia Garza, Black Lives Matter, Opal Tometi, Patrisse Cullors. Bookmark the permalink.